We moved into our house this summer in July, and we've already knocked out several rooms on our to-do list. 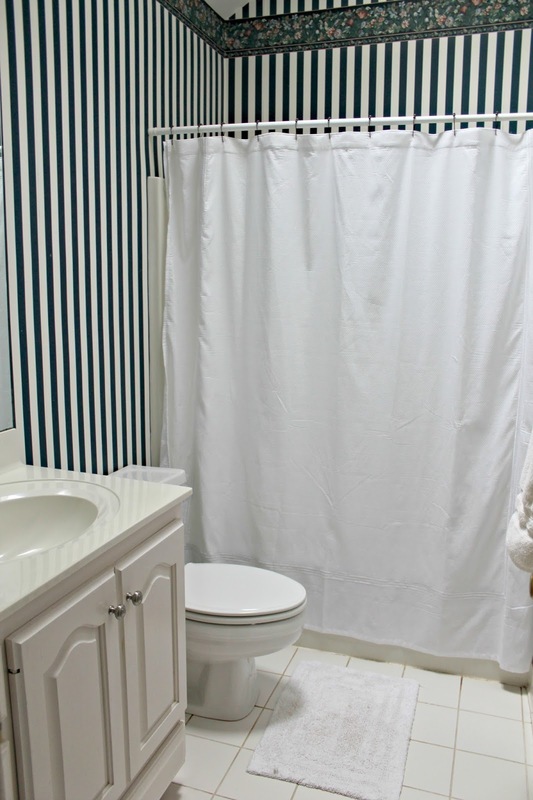 One room that I've been neglecting was our hall bathroom. Mainly because of the daunting task of taking down wallpaper. 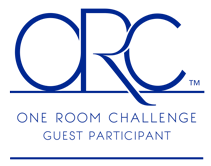 I've enjoyed reading other blogger's One Room Challenge posts, and I work really well with a deadline, so I figured this would be a fun little adventure for the next month. Once you look past the wallpaper, there are some really good things about this bathroom. There's a skylight, so plenty of natural light comes in. The layout is fine, we won't be moving any plumbing around. 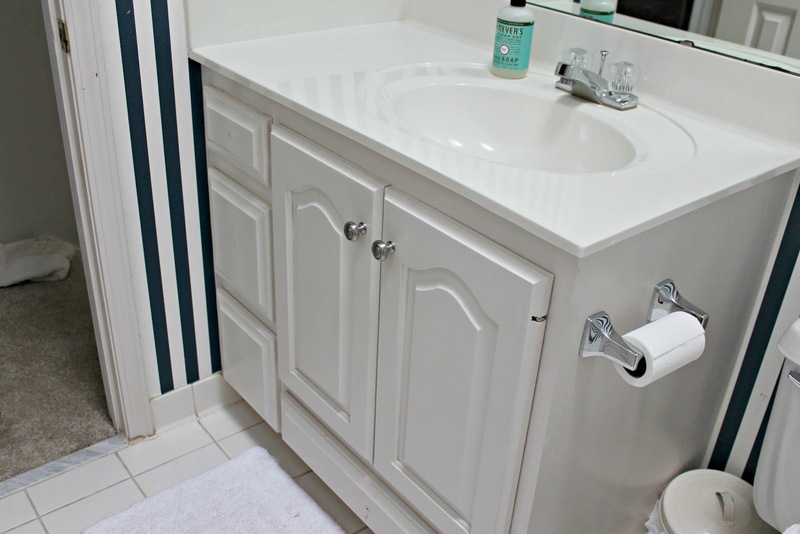 And for the most part, the toilet, shower, and sink are all in great condition. I'll probably hit the vanity with a new coat of paint, but that's really all it will need. As for the style of this room, I'm going for a bit more of a masculine look. Well, more masculine than the other rooms in our house. A dusty blue color for the walls, rustic wood, and dark metals. 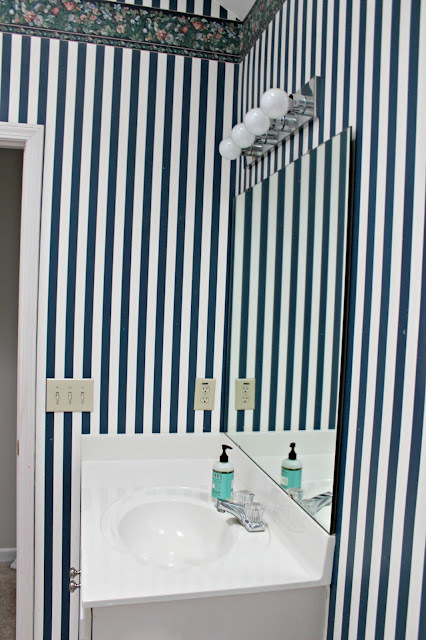 I love the look of a ticking stripe shower curtain, too. 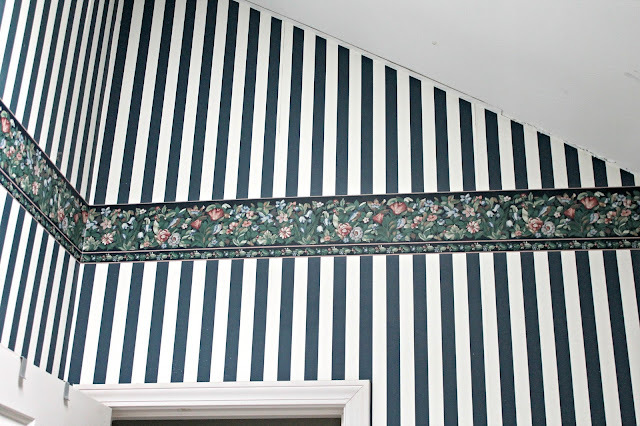 (Weirdly enough, it's kind of an ode to the old wallpaper in there.) Here's a little peek at my inspiration board for the room. So there you have it! 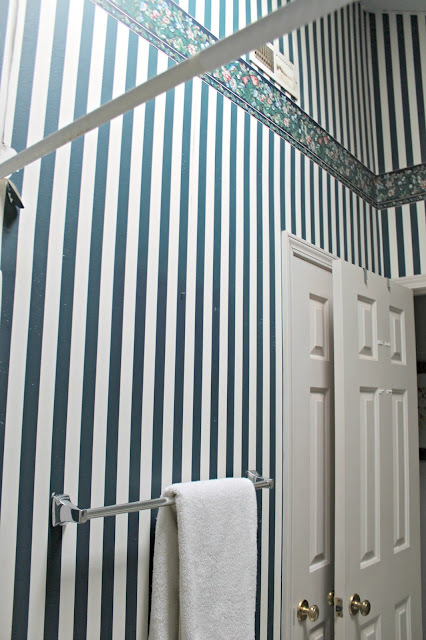 I hope to tackle the wallpaper this week, that's definitely the biggest beast, and I can't do anything else until that's down. Wish me luck, and not too many broken fingernails. You can follow along with my progress as well as other bloggers' progress on their rooms by clicking the image below. Love the inspiration design board and can't wait to follow along through the process! Good luck with the wallpaper & this challenge! Can't wait to see how it turns out. Looks like a great project! Good luck and I can't wait to see your progress! Would love to hear how you remove the wallpaper. We also have a wallpaper challenge in the near future! Cannot wait to see this room unfold!! So glad you joined in on this crazy adventure!! I feel your pain with the wallpaper. When I bought my house it was covered in wallpaper and was the worst task to date. Good luck! I can't wait to see the fresh walls. I love your inspiration. Love your inspiration photo. Bathrooms are hard work but so worth the effort.